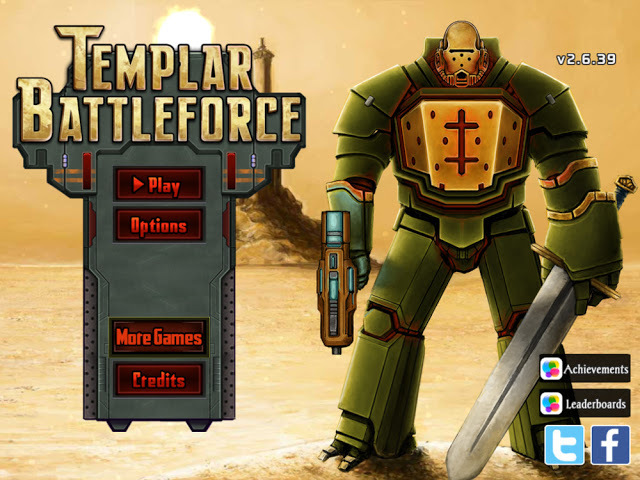 Have you ever heard of the game Templar Battleforce by Trese Brothers Games for the IOS? I had not until I came across it in the IOS Store. In this post, we review that game. 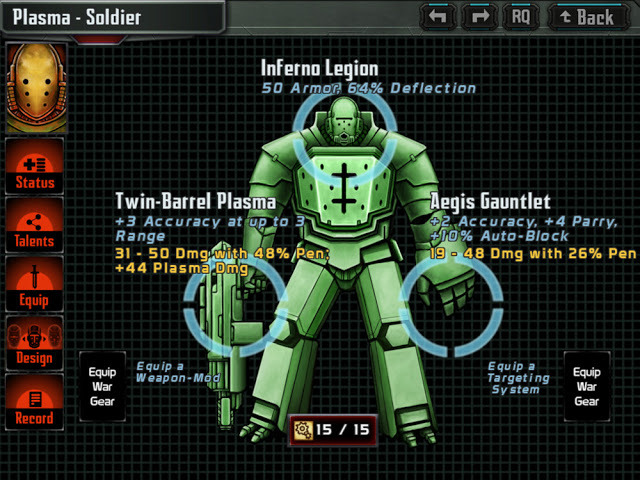 Templar Battleforce is an IOS Game similar to Space Hulk and other games in that genre. Typically, I don’t play Computer or Console games because I get hooked too deeply into them and end up losing a lot of time to a virtual world. 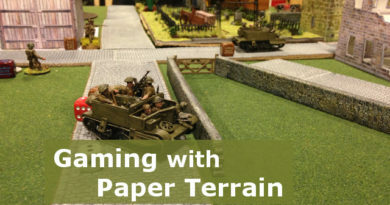 Personally, I would rather be playing a tabletop miniatures game. Despite that mindset, I do enjoy the occasional game on my IPad. Why the IPad over the Console or Computer? I find it easier from which to walk away. There are some real gems on the IPad with X-Com being favourite currently available. In search for something new though, I cam across Templar Battleforce in a bundle with another IOS Game. 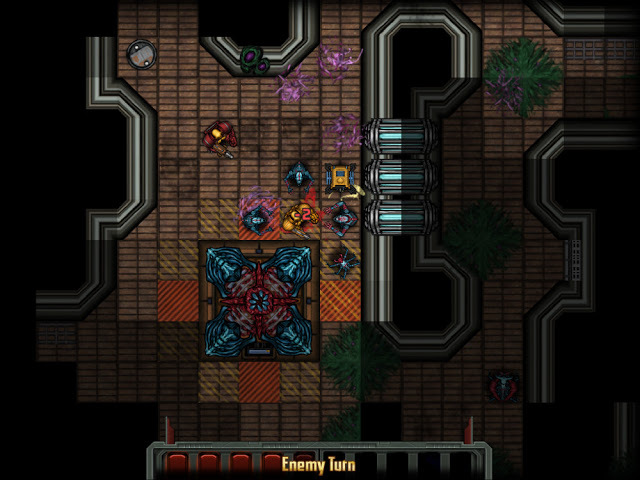 Once I launched Templar Battleforce, I was very pleasantly surprised. As you can tell from the cover art, it contains Space Marine type warriors in heavy armour with larger than life weapons. The gameplay is top down tactical and it feels like a hybrid miniatures game on an IPad. 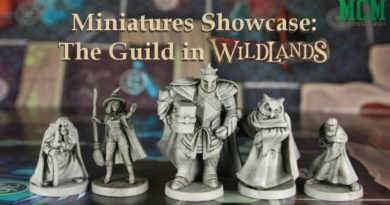 What do I mean by a hybrid miniatures game? 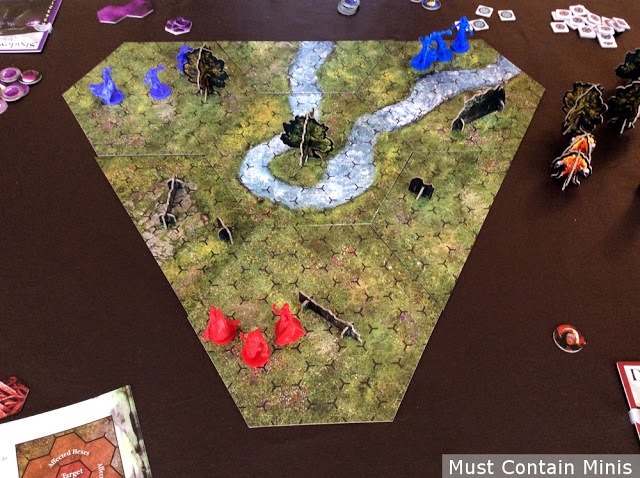 Well, it has a feel of a tactical miniatures board game (basically a good dungeon crawler) over something more like a Skirmish Miniatures game. That said, I got a great miniatures “fix” playing this game over the last couple of months. Note: The video is of the PC Version of the game. The IOS version is very similar. Overall, this is an excellent game that I highly recommend. It has the feel of a more involved Space Hulk with your initial enemies being Alien Creatures (eventually you will find yourself also fighting what would be considered the equivalent of Traitor Guards).Where this game excels is in Game Play and Character Customization. Like X-Com, your characters gain levels, learn talents and improve their statistics. Unlike other games, you get to choose exactly how to improve each character. 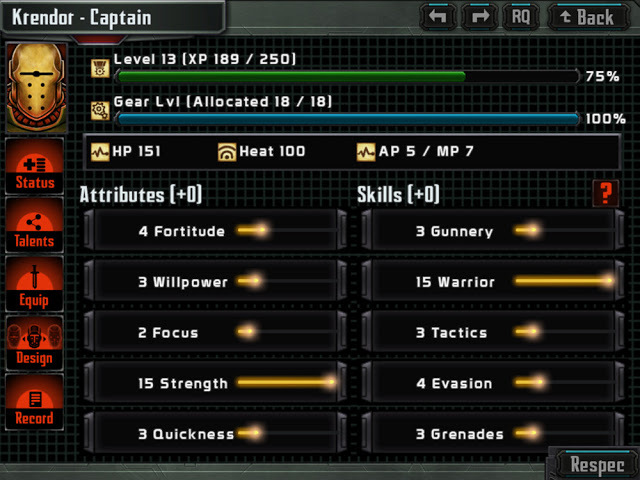 You can also re-jig your soldiers’ stats and abilities or create multiple characters to choose from. As you may know from my Rogue Stars Review, I really like games where you can customize your characters. This game brings a lot to the table for customizing characters. There are multiple classes that you can use to design your characters. Above are my four highest leveled characters in the game I am currently playing. You also get to spend points on talents. My Plasma Armed Soldier has focused on Burst Attacks for his best talent. He has also upgraded the grenade talent a few times to allow for better grenade attacks (not pictured). 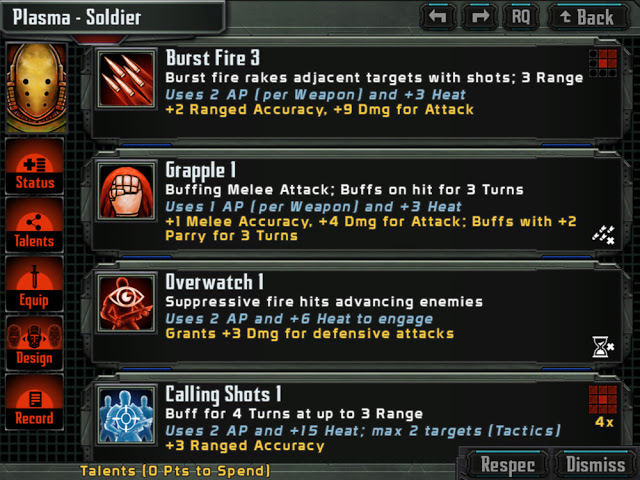 On top of customizing Talents, Skills and Attributes, you get to outfit your soldier. This soldier has a Light Powerfist, some Power Armour and a Plasma Gun. After every battle, characters get experience and gain levels. 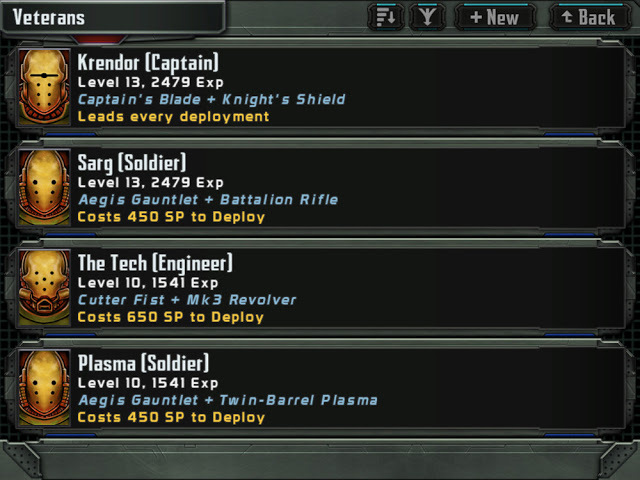 You as a commander also get Requisition Points that you can spend on the game’s Tech Tree. The Tech Tree determines what classes are available to you, what weapons are available and what talents your troops may have. 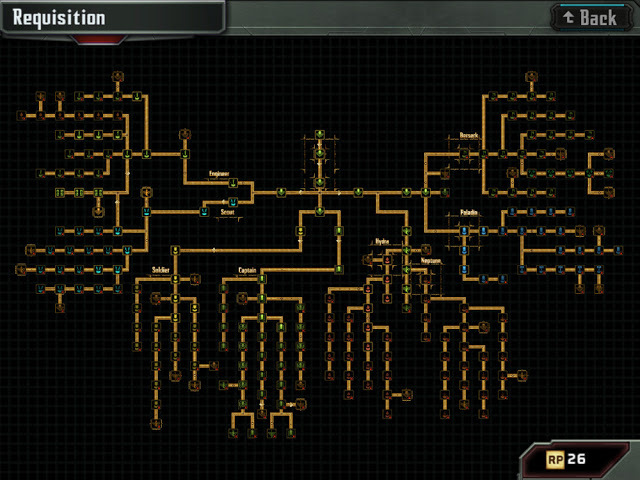 If you like meaty and chunky, check out this tech tree. There is a lot going on here and I like it a lot. Now, I have played many virtual “miniatures like” games and this is one of the better ones that I tried. While I feel that the game is great, there are a few areas where other games do it better. Those areas are in Graphics and Sound. One of the first things that I noticed is that the weapons that you arm your soldiers with don’t change the in game “models” that much. Likewise, changing armour is not represented in either the combat graphics or in the model equipment image. The graphics in the battles and menu systems are also not the best out there on the market. They are good enough, but they are not great. Finally, I found that the music got tiresome over time so I eventually played the game without sound. An image of the game in play. My Engineer is at an enemy base and trying to convert it into my own (so I can hire more soldiers). Unfortunately for him, he is surrounded by four tough aliens. His days might be numbered! While I have criticisms about the game’s graphics and sound, the game play in Templar Battleforce is excellent. If you haven’t given this game a shot, check it out. It might make for a fun distraction during the busy holiday season.